Alternate title for this post: "From Lightness to Leaning in two years." We are now more than half-way through the winter, and one of my and Riley's goals for the winter months was to improve the canter work so that we at least have a shot at First Level in 2013. You all know about the me, and Riley, and the canter (if you followed our 2012 show season). We could get the canter, but we couldn't "hold" the canter. I think we maintained our canter throughout the tests maybe 2/3 of the time. 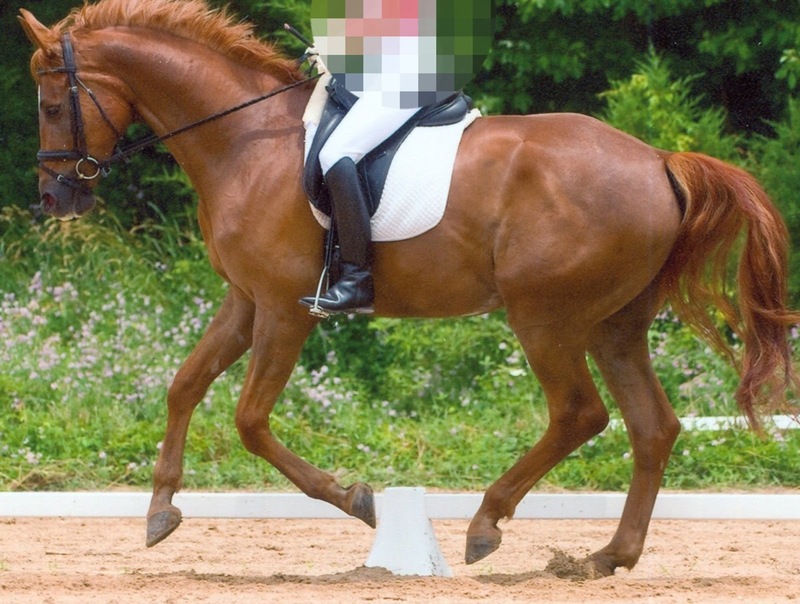 I mean, sure, it's Training Level, but I think the judges like to see horses a) cantering where they're supposed to be cantering and b) cantering in a way that does not suggest they are careening down a 15% incline. The photo upper right photo shows a pretty typical canter, circa 2012, for Ri and I. The 2012 canter is different from the canter he offered when he was in professional training as a four-year old, circa 2010. [Nota Bene: my new policy is to give my trainers anonymity, mostly b/c the Internet is a weird place -- hence the photo cropping etc.). Note the lovely elevation and softness. I'd like to say Ri looks equally happy enough in both photos--if I'm not riding well, at least he doesn't look abused. Butclick on the 2012 photo and look at his face -- he actually appears to be nodding off. Relaxation may be on the training scale, but sleeping is not. It is so easy to slip into the bad habit of being "too soft" – and by that I mean 1) not making our horse take responsibility for maintaining gait, 2) not expecting our horse to respond energetically and enthusiastically to our light aids, and 3) not keeping our ARMS long and our REINS short. Can you tell I've been listening to Jane Savoie? Well, she's right and it WORKS. I rarely have the opportunity to work with a trainer and never have a ground person, so it can be easy to slide on these things. The video from my first show with my young horse last weekend was a graphic reminder of that. Thing is, my horse seems happier (and instantly better at everything!) when I keep the above points in mind EVERY ride, THROUGHOUT the ride. I'm showing again a week from today and expect to see improvement in our tests. Lots of good work and half halts ahead of you this season. Both you and Riley certainly have the talent to aspire to the upper levels, so I'm sure you'll get there. I'll be most interested in following your progress and success. These pics are not the same part of the stride, so you're being a touuuuch hard on yourself by comparing!